Product prices and availability are accurate as of 2019-04-18 09:17:41 UTC and are subject to change. Any price and availability information displayed on http://www.amazon.com/ at the time of purchase will apply to the purchase of this product. Put Baby Stella to bed in the Goodnight Pajama Set Outfit. 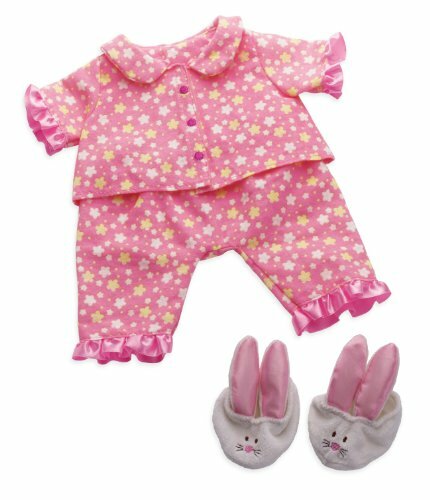 This adorable pajama set is made of flannel-like fabric that will keep Baby Stella cozy and warm all night long. The outfit includes a pink pajama top and pants, along with a pair of soft bunny slippers, easily fastened by Velcro-like closures on the back. Baby Stella by Manhattan Toy is an ideal first baby doll collection that will encourage little ones to role play, nurture, and care. Baby Stella dolls, sold separately, are completely soft and beautifully crafted with life like details such as a belly button and perfectly plump tummy. You can change her outfits and every doll comes with a magnetic pacifier. The Baby Stella Collection offers a variety of soft and safe accessories that allow little ones a caregiving experience. Since 1979, Manhattan Toy has been making award-winning, high quality, educational toys for your baby, toddler or kid. From incredibly soft plush toys to baby dolls and doll accessories, our goal is to provide the safest and best toys available. All of our products, from the newest concepts to our time-tested classics, are innovatively designed to inspire imaginative play and are routinely safety tested to pass strict CPSC, ASTM, EN71 and Health Canada safety standards.